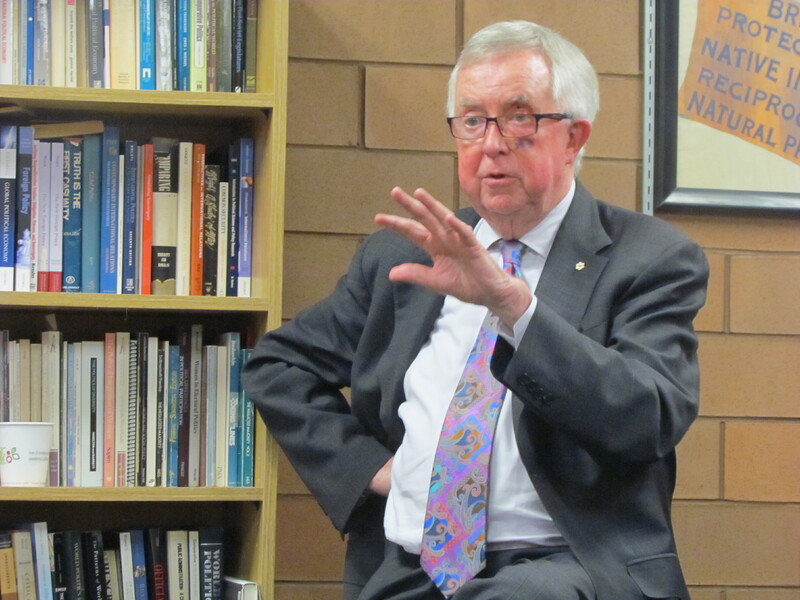 Former Prime Minister of Canada (1979-80), the Honourable Charles Joseph Clark, visited UW on May 22 to express his concerns about relying on polling and lack of citizenship engagement in Canadian politics. “The world of politics that I entered in 1976 was very different from where it is now. It was much more about people, and much less about technology,” Clark said. Clark has an extensive career as a civil servant. A graduate from the University of Alberta, he used his time as a student to pursue journalism and politics, writing for his student newspaper, and becoming involved in campus and provincial politics. He first became known in Canada in 1976, when he won party leadership for the federal Progressive Conservatives. Clark has since been leader of the official opposition party, prime minister, secretary of state for external affairs, and minister of constitutional affairs. Polling, a method politicians use to find out what public opinions are, is something that Clark thinks is now relied upon too much by politicians. Clark believes dealing with situations by instinct is valuable but, is now a rare phenomenon. Clark was concerned that the Harper government relied too much on campaigning to it’s voting ‘base’—the people they knew would support it—rather than the whole of Canada. He is also troubled that the Trudeau government is heading in the same direction. This could cause division within Canada, as governments could miss entire groups of people’s needs. Clark worries it might decay the diversity that Canadian society currently thrives on. “We in Canada have an unusual reality and reputation, we are [unusually] diverse, and more respectful of our diversity,” he said. To maintain their identity, it requires acting together and it, “runs against playing to your base,” he said. Relying on instinct, rather than polling, helped Clark in 1982, when the Honourable Pierre Trudeau introduced a constitution package. “I had to respond to this on about four hours notice, [while] Mr. Trudeau had had months to prepare it,” he said. Clark did not have time to consult his caucus or to find out what the public opinion was from polling. He followed his instincts, and announced that he would not support certain elements of the constitution package. Later, he learned that the polls showed that Trudeau had 92 per cent of support, while he had less than eight per cent. This constitution package was to change Canada’s highest legal legislation, the British North American Act, from British Parliament control to Canada’s federal and provincial legislature control. Clark was proud to have delayed the process on this, as it allowed for the new constitution to undergo judicial review and for federal-provincial to settle on an agreement. Clark attributed his success to relying on his instinct. “You can still make good decisions without polls,” he said. Clark said he also believes that polling can help politicians see issues that aren’t addressed by current policy and programs in place. “[It’s a] very legitimate thing to determine what issues are on people’s minds,” Clark said. Clark also called for innovation in citizenship, rather than where it has been dominating— in STEM fields. Clark said when he was in office he wanted from electorates to engage. “I would want engagement, and I would want respect… Someone’s who is [going to] follow their most generous beliefs… And so we have to make engagement easier, and deviations from respect less acceptable,” he said.